Not bad! Not great, but not bad, either. Carnival of Souls opens with Mary in a car with two other girls when they are challenged to a drag race. The car they are in goes over the edge of a bridge and sinks. Three hours later, while the town is still searching for the car, she emerges from the water, unharmed. When we see her next, she's traveling to Utah to begin a job as a church organist. On her trip there, she sees a strange ghoulish man. She begins to see him in different places even after she's reached her destination, along with other strange delusions, such as suddenly becoming invisible to the people around her. As she tries to figure out what's going on, she's mysteriously drawn to an abandoned carnival near a dried lake. When she travels there on her own and sees the ghoulish man, what does it mean for her? I dug this one. It's low budget, low tech, and low action, and aside from the lead actress the cast is only so-so. Despite those limitations, though, it succeeds. The scene near the end of the movie, when Mary returns to the carnival for the final time, actually made me shiver like nothing else this month has. The creepy man has the most awesomely sinister face. The soundtrack is excellent. The plot is kind of like Let's Scare Jessica to Death by way of An Occurence at Owl Creek Bridge. 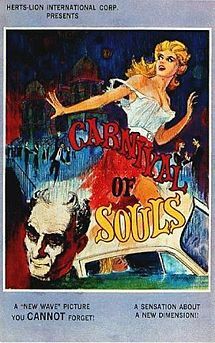 I give Carnival of Souls four pipe organs out of five.